The Southern Round Up heads up the coastline from Christchurch instead of cutting straight over to the West Coast. This way you get to see Kaikoura, Blenheim, Picton, Kaiteriteri, the Abel Tasman National Park and its famous golden beaches. If you’re short on time this is a great way to see the highlights of the South Island. If you’re not short on time you can always add the Milford Explorer or Deep South later to see even more. Accommodation not included in these passes however we reserve accommodation for you at every overnight stop for the first night of your stay, with 3 nights in Queenstown. Pay as you go or prepay accommodation pack now! Add your accommodation pack to your Kiwi Experience pass at the checkout. This South Island focused pack includes the three newest additions to the Kiwi Experience route. Enjoy the sunny golden beaches at Kaiteri Lodge, a genuine West Coast New Zealand pub and the snow-capped beauty at Lake Tekapo. 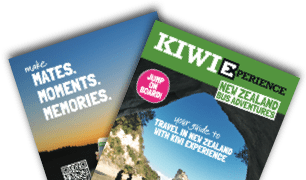 Experience the spectacular diversity of the mainland of Aotearoa with this perfect pack for South Island travellers.The South Island is a super special place and this pack combines some real kiwi classics.